. . . 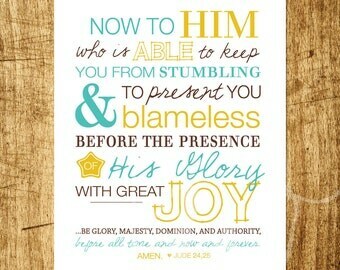 Able to keep you from stumbling. If we were strong, surefooted mountaineers, this would not matter so much; but in ourselves, how weak we are! On the best roads we soon falter; in the smoothest paths we quickly stumble. These feeble knees of ours can scarcely support our tottering weight. A feather may divert us, and a pebble can wound us. We are mere children taking our first trembling steps in the walk of faith; our heavenly Father holds us by the arms or we would soon be down. If we are kept from falling, how we should bless the patient power that watches over us day by day! Think how prone we are to sin, how apt to choose danger, how strong our tendency to stumble and fall, and these reflections will make us sing more sweetly than we have ever done, “Now to him who is able to keep you from stumbling.” We have many enemies who try to put us down. The road is rough, and we are weak; but in addition to this, enemies hide in ambush and rush out when we least expect them and try to trip us up or throw us over the nearest cliff.